This article demonstrates the capability of the Qt framework on Toradex computer modules. 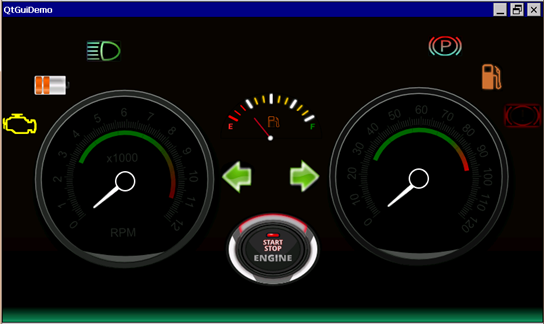 The instrument cluster is used to display the status of the vehicle systems, information and drive conditions. 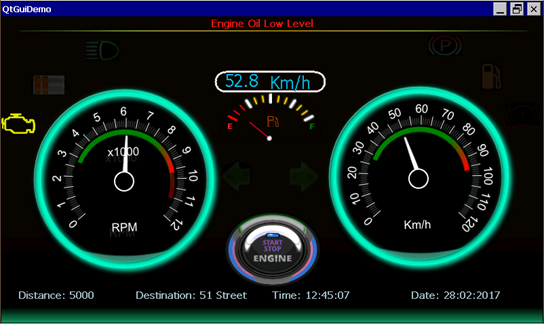 This includes gauges for various parameters, indicators and status lights but also displays and acoustical effects. Open the project in Visual Studio, right click on project -> Convert project to Qmake generated project. The QtAutomotiveClusterDemo folder will be created in the Flash Disk on the device, which will contain the design files(qml/images) and executable. All the required DLLs will be deployed under the FlashDisk->System folder in this way multiple projects can share the same DLLs. Download the running Demo with executable and all the required DLL here .